Smackdown this week was one of the strongest episodes of the show for a long time. This was for a number of reasons, there were a number of intriguing contests, such as Alberto Del Rio vs. Rob Van Dam, some significant storyline progression with Cody Rhodes and Damien Sandow and some top notch promo work from CM Punk, AJ Lee and Dolph Ziggler. This match had been announced on Monday’s Raw and I was intrigued from the moment it was announced. Firstly, I’d put Rob Van Dam as one of my picks for a possible opponent for Alberto Del Rio at SummerSlam and felt that this match would provide a lot of the answers heading into the pay-per-view. Secondly, we were yet to see Van Dam lose since returning to WWE, after victories over Chris Jericho, Darren Young and Wade Barrett over the last week and a half, and WWE would clearly want to keep their newest acquisition looking strong for the time being, however Alberto Del Rio is the World Heavyweight Champion and him loosing matches will only help to devalue the Championship around his waste, and after a loss to Randy Orton on last week’s Smackdown, Del Rio couldn’t really afford to lose for the second week running. We got a glimpse of what was to come in a backstage segment, with Alberto Del Rio meeting with new Smackdown General Manager Vickie Guerrero. Del Rio was attempting to get Guerrero to give him the same chance that Brad Maddox gave John Cena on Raw, allowing him to pick his opponent for Summerslam. Vickie agreed to give him one week to think about it. It was nice to keep the authority on the show very simple, with few shenanigans it allowed the real talent to shine through. Rob Van Dam then turned up, to put his case forward for why Del Rio should choose him as his Summerslam opponent. It was a nice set up for the match later on, that gave an extra reason for Van Dam to pick up a victory. The match, unfortunately, didn’t really get going, with Van Dam using his strong kicks to beat down the World Heavyweight Champion, with Del Rio running to the outside. It didn’t take long for the match to go for a finish, as after Del Rio came back into the ring, Van Dam once again gained the upperhand, with the referee keeping Van Dam away from Del Rio who was in the corner, Del Rio used the opportunity to hit a Superkick for the pinfall victory. Whilst I felt this match could have been a really good contest given some extra time, it did a good job of keeping both men looking strong and developing Del Rio’s role as heel role, whilst also setting up for a potential rematch later down the line. Whilst Van Dam’s loss here doesn’t totally rule him out of facing Del Rio at SummerSlam, I’d be surprised if WWE ran with it now. It’s a match up with a lot of potential, if done correctly, but there are more interesting match ups to include Van Dam in on the pay-per-view and I couldn’t believably seeing him winning the World Heavyweight Championship, not at this point anyway. I also wouldn’t expect Del Rio to be allowed to pick his opponent, as his character would surely choose someone he could easily beat, like Zack Ryder or Yoshi Tatsu. So, I’m interested to see how the decision will be made and who will get the nod, hopefully we’ll find out next week on Smackdown, rather than on Raw. We kicked off Smackdown this week with the two Money in the Bank winners facing off. Whilst the action in the ring was solid, for the most part, I wasn’t really given any reason to care about the outcome of the match. There was no prior explanation as to why these two were facing off on Smackdown and it really could have done with a bit of a build up, similar to what they did with Van Dam and Del Rio, for me to fully invest in the action I was seeing in ring. Orton did his usual going through the motions, something we’ve also seen out of Sandow as of late, and it felt pretty flat throughout as the two basically trod water as they waited for the finish to take place. That finish involved Sandow’s former tag team partner Cody Rhodes, who came down to ringside and took possession of the World Heavyweight Championship Money in the Bank briefcase, with the distraction allowing Randy Orton to get in the ring and hit an RKO for a pinfall victory. It was the only way they could end this match, without making one of the Money in the Bank holders look weak, so I was just glad that Sandow didn’t lose to Orton clean. If I’m being honest the finish was the only thing that really caught my interest during the match, and I’m hoping Orton and Sandow both pick up their games big time once they get their pushes with the respective championships. What followed however was pretty interesting and enjoyable, with Damien Sandow attempting to locate Cody Rhodes, who had absconded with the World Heavyweight Championship Money in the Bank briefcase. We saw humourous exchanges between Sandow and other wrestlers and personalities, like Sin Cara, Mark Henry and Hall of Famer Booker T, which ran throughout the show. Sandow did a good job of treading the line between comedy and serious here, as while I’m not of the “Funny ain’t Money” school, I certainly think if you over play those moments, people will become disengaged with the angle. Finally, in the final segment of the show, Sandow went back to the ring in attempt to find out where Cody Rhodes had got to. Rhodes turned up on the big screen, standing by the Gulf of Mexico. Of course it’s some kind of unwritten rule, that whenever WWE is in Corpus Christi there has to be an angle involving the Gulf of Mexico, we’ve seen CM Punk and Chavo Guerrero battle it out in a Gulf of Mexico match on ECW, as well as Kane chokeslam Rey Mysterio into the sea on Smackdown. Sandow, of course, went after Rhodes and apologised for everything he had done in a grovelling attempt to get his briefcase back. I really enjoyed this moment, as it showed Sandow as a really spineless character, which is certainly a role that suits him well. Rhodes threw the briefcase into the Gulf anyway, and Sandow attempted to jump after it, but it was revealed he couldn’t swim! We ended the show with Sandow lying exhausted on the pavement, whilst the briefcase sunk under water. I actually really enjoyed this angle throughout the show, it was a little goofy at points and maybe a little clichéd, but I felt genuinely invested in the feud and wanted to know what will happen next. Elsewhere, CM Punk also made a rare appearance on Smackdown, and this time did a much better job than a few weeks ago. Punk delivered a well-structured promo on his upcoming SummerSlam match with Brock Lesnar. Punk once again put over Brock well, before moving onto Paul Heyman. Punk said he would exploit Lesnar’s only weakness and that would be his trust of Heyman. It added a nice extra layer to match at SummerSlam and where Heyman’s involvement will surely be key to the outcome of the match. WWE need to be careful not to have Punk and Heyman repeat themselves in these promos we’ve seen from them in the last few weeks, as we still have three more weeks until SummerSlam, if we see the same thing for the next few weeks, the angle will lose its current red hot momentum. With Punk hitting his stride, surprisingly he was interrupted by Fandango, who got seemed to get real heel heat for the first time since the post Wrestlemania Raw, there wasn’t a lot of Fandangoing going on here. After Fandango’s theatrics on the way down to the ring, with valet Summer Rae, Punk quickly took down Fandango attacking him as he entered the ring and finishing him off swiftly with a GTS. I liked this moment, because it showed off Punk’s emotional state and also made him look like an arse kicker, which is something that WWE needs to do, with Punk heading into a match with the much bigger Brock Lesnar. I’d like to see Punk in a number of matches on Raw and Smackdown in the next few weeks, ploughing through mid-card opponents, to help demonstrate his state of minding heading into the pay-per-view. The AJ Lee and Dolph Ziggler angle continued this week, with AJ Lee giving her “State of my Mind” address. AJ cut one of the best promos I’ve ever seen from a woman on WWE television, bringing a lot of intricacies in to her performances, as she revealed she still had the keys to Dolph Ziggler’s house but wouldn’t use them. Dolph then came out and continued to wind up AJ, talking about new lovers, with some content that didn’t feel very PG. AJ moved onto plan b, as she destroyed items from Ziggler’s wallet and suitcase, with Ziggler batting off the attack on his belonging further frustrating AJ. I think what works well for me here, is that whilst the things Ziggler are saying aren’t exactly face comments, we’ve all had that one crazy girlfriend and it’s good to see Ziggler getting one over on her for us! With AJ angered she attempted to get at Dolph, but ran straight into a spear from Kaitlyn. With Big E attempting to help AJ, he got a Fame Asser from Ziggler for his troubles. With Kaitlyn being added to the mix, I’m wondering if WWE will go with a mixed tag for SummerSlam instead of the rumoured one on one match between Ziggler and Big E.
In what was essentially a squash match, Mark Henry teamed with The Usos to take on Wade Barrett and The Prime Time Players. After Barrett and The Prime Time Players had took control of The Usos, it built to a hot tag to Mark Henry, who quickly ploughed through his opponents picking up a pinfall victory on Titus O’Neil after a World’s Strongest Slam. The match was enjoyable, but it was pretty clear who was going to pick up the win and how the match would unfurl from the outset, as Henry and The Usos sent a message to The Shield. It really is a shame to see Wade Barrett fall even further down the card, WWE really seem to have soured on the Preston man. The Prime Time Players are currently in limbo at the moment, it seems that WWE is going to split them up soon, but if they keep putting them in position’s like this, no one will care when it happens and Young and O’Neil’s singles careers will be no different to their tag team one. Christian was also in action this week, against Jack Swagger. Of course, Zeb Colter cut a promo before the match again, but I’ve already said all that needs to be said about that in this week’s Main Event review. Anyone who watched WWE’s revival of ECW will know the history between these two and I was actually pretty excited to see them in action again. The bout was a fairly good technical battle that was well paced, and given just enough time to allow Christian to look good. After Swagger’s poor match with Sheamus on Main Event, I was glad to see Swagger could still go, I just think he needs the right opponent to go against, he isn’t someone who can have a good match with a broomstick. Christian picked up the victory, in a nice closing section, after rolling out of a Patriot Lock and sending Swagger shoulder first into the ringpost, Christian hit a Killswitch for the pinfall. Christian has picked up a number of victories following Money in the Bank over the likes of Damien Sandow, Fandango and Titus O’Neil, and therefore I think he is a strong candidate to get the nod to face Alberto Del Rio at SummerSlam. 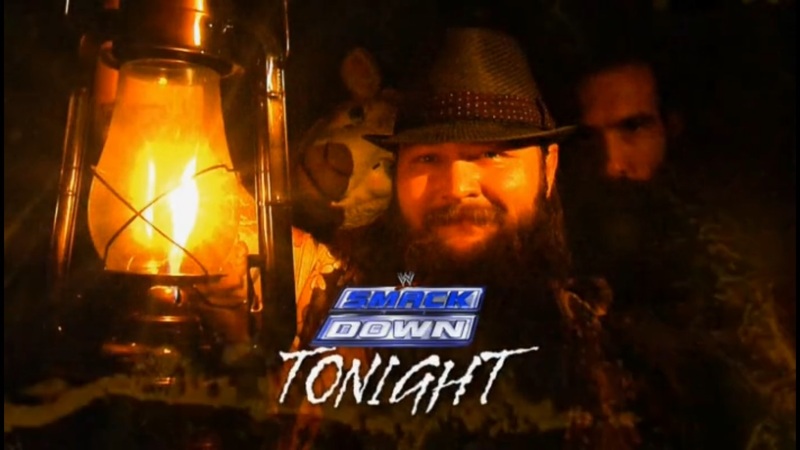 The Wyatt Family’s Luke Harper and Erick Rowan made their in-ring debut this week, as they took on Tons of Funk. It was quickly over with The Wyatt’s dominating and Erick Rowan picking up the victory with a running splash on Tensai. It was a disappointing generic big guy finish that I think most of WWE’s bigger stars use, including Tons of Funk, so hopefully it doesn’t stick and they get a better finish. After the bout, Bray Wyatt came into the ring and took out Tensai with Sister Abigail, before cutting another disturbing promo on Kane. With Kane in action against Daniel Bryan on Raw this week, could we see The Wyatt Family get involved? I sure hope so. What did I learn from Smackdown this week? 1. Sometimes, like with RVD and Alberto Del Rio, less is more. As I know want to see a rematch more than I wanted to see the original. 2. Damien Sandow can't swim. 3. Michael Cole reads the same damn facts on every show. I know John Cena is the only person not to cash in Money in the Bank successfully. At least, JBL seems to do some research!